If you send cards to Operation Write Home, be sure to check out their 'mailroom' section of the website before sending your next box. They are down to two shippers and are asking us to send envelopes with the cards. East coast residents like me will send our boxes to Kris in Kansas. I was just ready to send off a box when I read about the envelopes and I have a confession. My first reaction was 'Oh, I'd better go out and get some envelopes because I don't want to use up all my good Stampin' Up! envelopes.' I was soon chiding myself about this. Really, who deserves my good envelopes more than our troops? And who needs a good quality envelope more than someone who has to mail their card half a world away?? So I was a bit ashamed of myself and promptly got those SU! envelopes out and my cards tucked in for mailing. I don't think OWH cares what kind of envelope as long as the size is right. 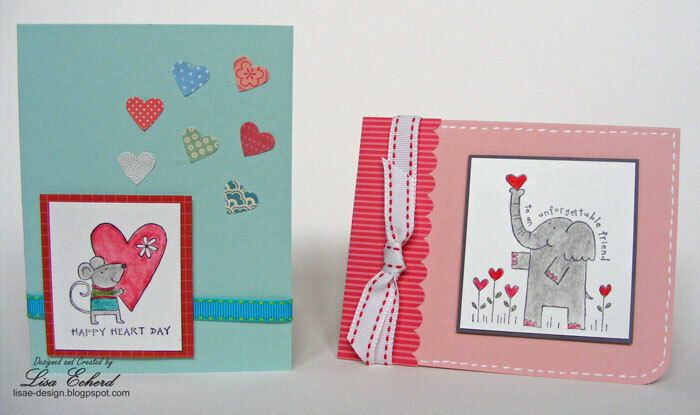 A couple of the Valentine's I sent are shown above. I didn't get as many cards sent to them this year. I'm not alone. That is why they are down to two shippers. They don't need as many cards as they once did but STILL do NEED cards! So if you have been sending them cards, keep them coming just check their site for more details on what they need. I hope you have a wonderful New Year! And I hope you will visit again on New Year's Day. I'll have a new video for you to start off the New Year! This year, I haven't taken as many photos as I'd like particularly of our every day lives. So I've decided to do Project Life or Project 365 again in 2013. With Project Life or 365, you take at least one photo every day. I did this one other year, 2010 and scrapped my one photo per day. 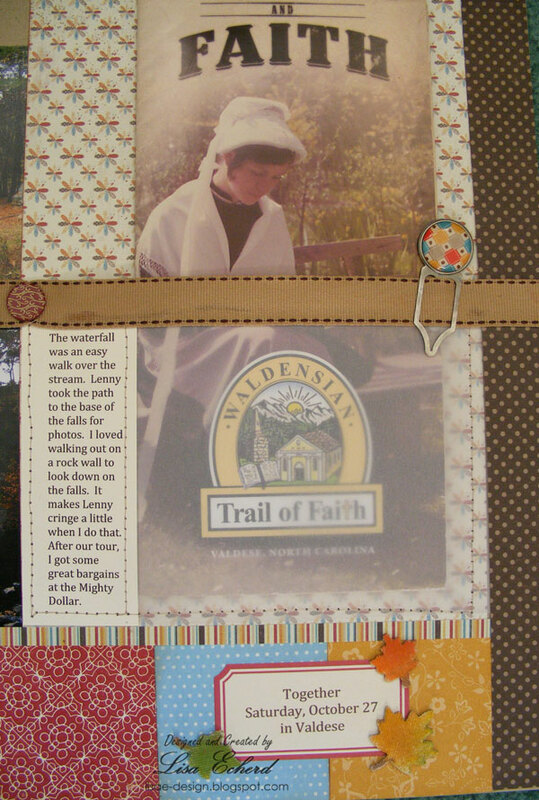 I first read about this process a year earlier in Creating Keepsakes magazine and I don't remember if there was a scrapbooking format or not but I chose to do my own thing. I prefer to do traditional pages. I just put a lot of photos per page - sometimes 7 per page for one week. Sometimes I spread a week over a two page layout. Sometimes I did a whole month in two pages. Sometimes I did a single page on one day's photo. It depended on the time I had available. I call my process "A photo a day, scrapped the traditional way." In this video I share a little of my 2010 album. 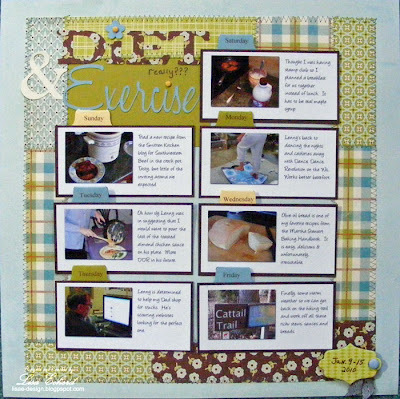 If you would like to see more pages, click here for the tag from this blog for Project 365. Most of those posts are from my 2010 album. My plan for 2013 is to do one video a week. Some of them will be Project Life/365 and some will be regular layouts. I'm trying to streamline the videos with a goal of keeping them to 10 minutes or less. We'll see on that one :-) I'll share some sketches in a PDF file here on the blog. I noticed in reviewing the 2010 album that the emphasis was really on the photos. I like that and I'd like to add more journaling, too. I hope you will join me. To visit my YouTube channel, click here. I'd love to have you as a subscriber. Whether you plan to do Project 365 or not, I hope you will commit to capturing more of your daily life. We all take photos of the birthdays, holidays and vacations. Those make up a fraction of our lives. Let's leave our children and ourselves a memento of the great every day little things. A couple of weeks ago I shared some photos of the intricate gingerbread creations we saw at the Grove Park Inn in Asheville. 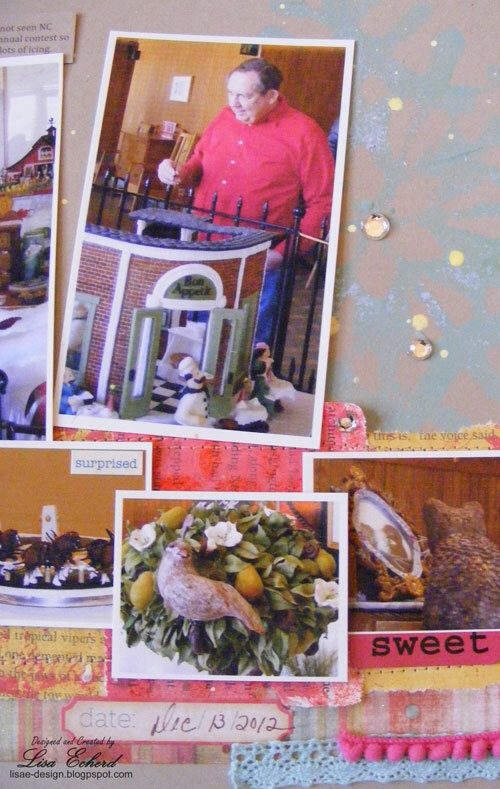 I scrapped these photos using techniques that are new to me via the "Dirty Fingers/Clean Design" class at True Scrap. During our visit to Asheville, we visited a lot of art galleries including some workshops with the artists working while we browsed. It was so inspiring. I was delighted to play with paint and ink on this page about part of our trip The main technique I used from the class was to paint, mask, mist, stamp and splatter on book pages. I didn't buy any holiday paper this year so I started with one piece of old My Mind's Eye (the stripe) as my color palette. It worked with all the busy photos. I pulled several paints in the red, blue, green and gold. 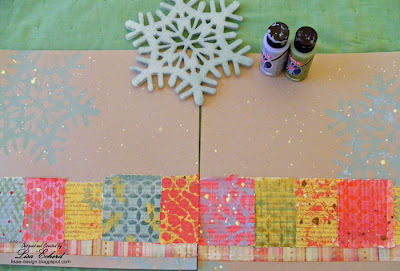 One of my favorite things is to mix up paint colors to create a match so this was a wonderful chance to do that and throw in a little misting while making my own pattern paper. In the class, Julie suggests using book pages as background. This worked beautifully except for one thing. Be careful what book you pick! It was the first time I'd ever pulled a book apart. I had to get over that. We get most of our books from the library so my pickings were slim. I had a popular novel someone had given my husband he had already read. It was a crime story and I pulled pages from the end. 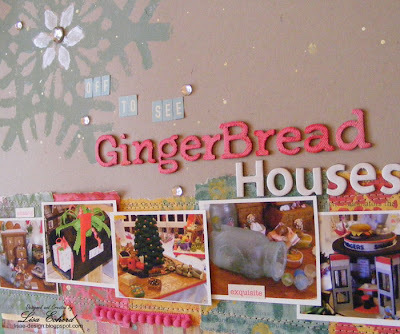 After I cut up my completed pages, there were a few words and phrases peeking through that let's say were 'inappropriate' for these cute little gingerbread houses. The class also inspired me to look for everyday things to make into stamps. This wasn't the first time I've heard of doing this but finally it sank in. 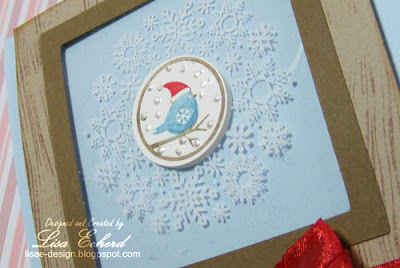 A trip to the dollar store yielded some white Styrofoam snowflakes that made great stamps. I covered one side in paint and just stamped it on my background paper. 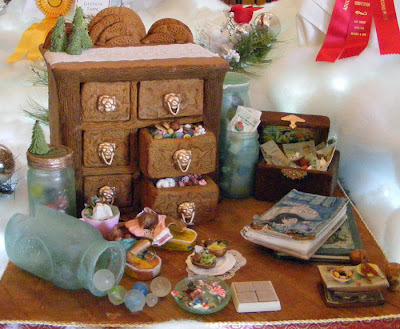 I'm still in awe of the craftsmanship of these gingerbread creations and I hope we get to go back again next year to see what people dream up. I mean "messy" in a good way, the kind of messy you get when you are playing with all your crafting supplies and completely losing track of time because you are having so much fun. That kind of messy. 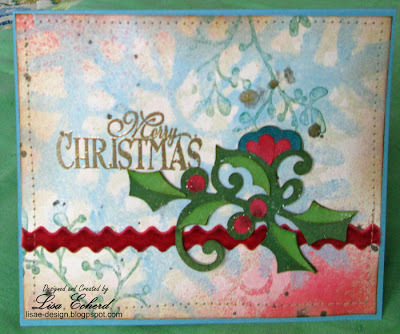 I did that on this card after taking the "Dirty Fingers/Clean Design" class at TrueScrap. Classes from TrueScrap 4 are now available for individual purchase (a little cheaper through Dec 25). I bought two of them - Nichol Magourik's which I know will be wonderful but I haven't had time to watch and the Dirty Finger's class. I had even more fun working on a layout on Sunday using the paint and ink techniques. I was having so much fun, I actually got ink on the back of my heel! No idea. Anyway, I'm not done yet but will have it up later in the week. One note about these classes: You have to watch the video on a directly connected computer - not wireless. I used my husband's PC and they played fine but they would not play on my wifi laptop. So for the background of this card, I played with paint and mists on some naturals Ivory cardstock from Stampin' Up! I love this stuff and so wish they made it in 12x12. 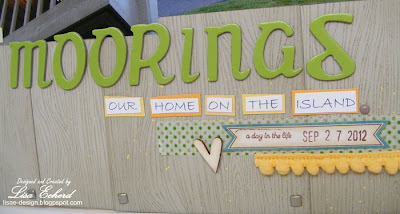 The die cut was cut on my Cricut with SCAL after downloading from SVGCuts.com. They have some free die cuts which are great. I'm not that big a fan of paper piecing so these are not things I'm likely to use more than once. This card is for my parents. One of the mists - the gold one - is the new Heidi Swapp Color Shine. These really are glimmery. Two Peas was out of the gold and silver so I got the bronze which can be gold to a very dark color depending on, well, I don't know what it depends on. Sometimes it is lighter and sometimes darker but it is very pretty. Thanks for visiting! I hope you do have a very Merry Christmas and enjoy time with those you love! A few years ago my husband and I finally figured out that buying each other gifts was, for us, swapping money. After over 20 years, we had given up trying to find the perfect 'surprise' gift and instead solicited what the other wanted and where to buy it. Since there was no surprise, it seemed kind of silly to buy the other what they already knew they were going to get and then making them wait until Christmas. So now we just get ourselves a little special treat at Christmas. I have at least one friend who thinks this is unimaginable not to have a gift to open on Christmas morning but for us it is working beautifully. So this year, my gift to myself was a new, smaller camera. I still like my regular digital camera but I wanted something I could easily carry with me. I got this Canon on Amazon for $80 and it seems to have almost everything my other camera has and it fits in the palm of my hand. Another 'odd' thing about us is that we don't have smart phones. We actually share one cell phone - one simple flip phone that takes photos but you can't download them only text them to someone else. We save a ton of money with this and again, it works for us. 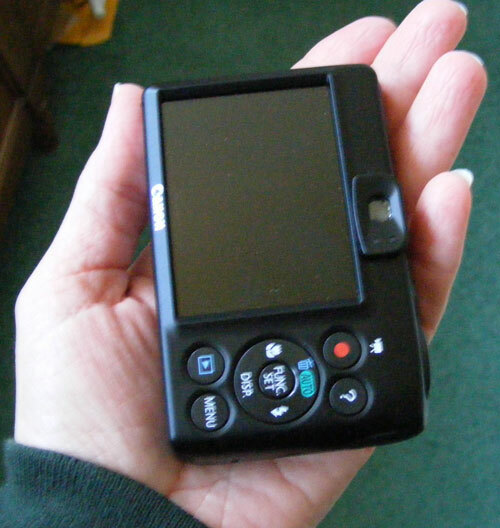 I could have gotten a TracPhone smart phone but it cost twice what the camera cost! Mainly I wanted the camera to capture the every day stuff particularly since I'm doing Project 365/Life next year. This one fits in my purse or pocket. I'm still a bit self-conscious about taking photos in stores, for example. But people with Smartphones do this all the time so why can't I with my little regular camera? We, scrapbookers, know that you need photos of all kinds of things to tell your story. I may look a little silly taking my Mother's photo when she is shopping for a new dress, but I'll be capturing her doing something she loves and I'll record the memory doing something I love. That's $80 well spent. like to use all or most of the real estate on the page. Seldom is there a border all the way around. Still, there is usually at least a corner for the eye to rest just like I advise customers to do with a room. Leave at least one wall clean so the eye has somewhere to rest. I don't know where I learned that but I like the philosophy. 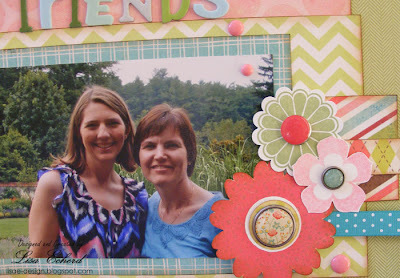 The paper and embellishments support the photo. They convey a mood that goes with the photo and story or at least I hope they do. This layout is an example. One of the things I most love about Hilton Head Island is that when you step off the beach, you are in the shade. Most of the island still has a large number of trees. They have preserved some forested acreage here and there as undeveloped. While there is plenty of development, those tall pines between the houses and along the bike paths make the island so peaceful and relaxing. Plus they really help on hot summer days. The condo we always stay in is a restful place with palms and other trees on the grounds. The buildings are on 'stilts' and everything is wood. 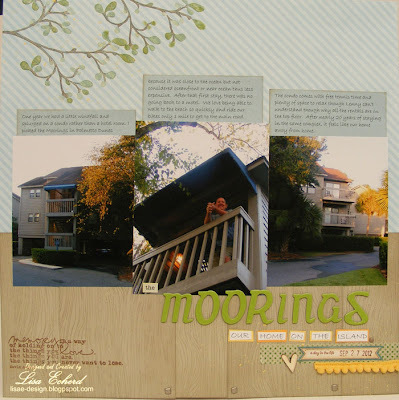 For my layout about the place we always rent, I stamped some Sahara Sand cardstock with a wood grain stamp and layered pieces along the bottom using brads like nails on the lower edge. 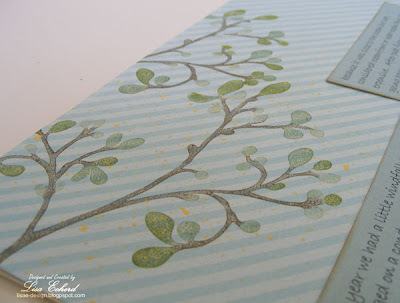 For the top of the page, I stamped some Echo Park paper with a branch and leaf design. It is a simple page, yet it immediately conveys the way I feel in these condos - relaxed and peaceful. One other aspect of my style is that my embellishments have to have meaning. They have to support the theme as well. Many times I wish I could let go of this but I can't put a butterfly on a page unless there was a butterfly around when we took the picture or it is an appropriate symbol of life. It's crazy and I wish I could lighten up a bit on this. 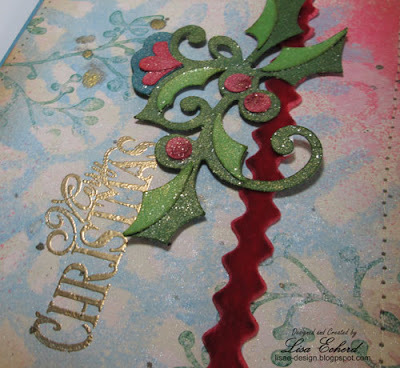 One embellishment that is exempt is ribbon. I love ribbon and trims - the seamstress in me - and they go on my pages, relevant or not. This little yellow pom pom fringe has been on so many layouts I can't even count and I still love it. 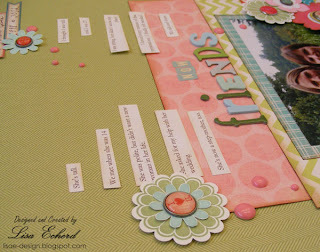 The most wonderful thing about scrapbook is there are no rules. Whatever our styles, we can create pages we love. 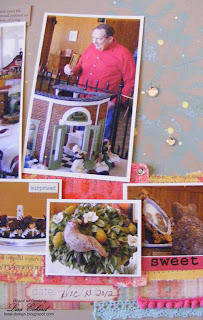 In 2010, I did Project Life or as I knew it then, Project 365, which I read about in Creating Keepsakes Magazine. 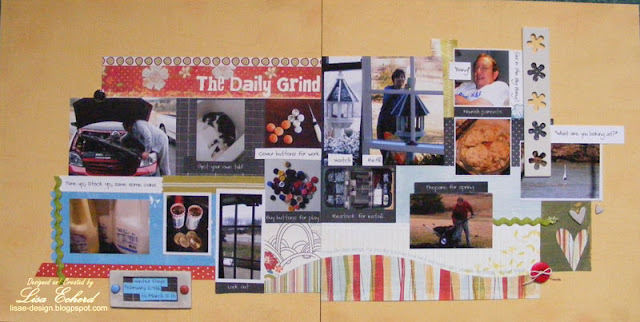 I took at least one photo per day and scrapbooked them. It was a great experience and developed one of my favorite albums of all time. A couple of pages from that album are shown below. I'm planning to do this again next year. I want to be sure my 2013 version covers our day-to-day but isn't a repeat of 2010. I've started by listing many of the topics I photographed and journaled from 2010. Some will be repeated to show what has changed. 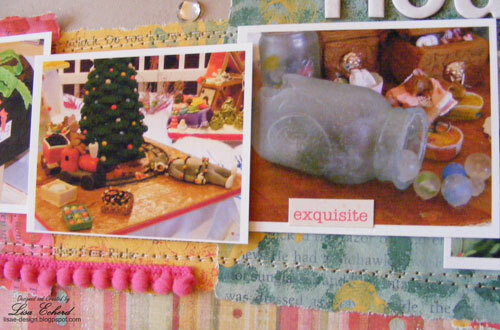 Holiday rituals - tree trimming, egg decorating, baking, presents, etc. Often I found a theme to the photos I would take in a given week. Diet and Exercise are usually hot topics in the new year. 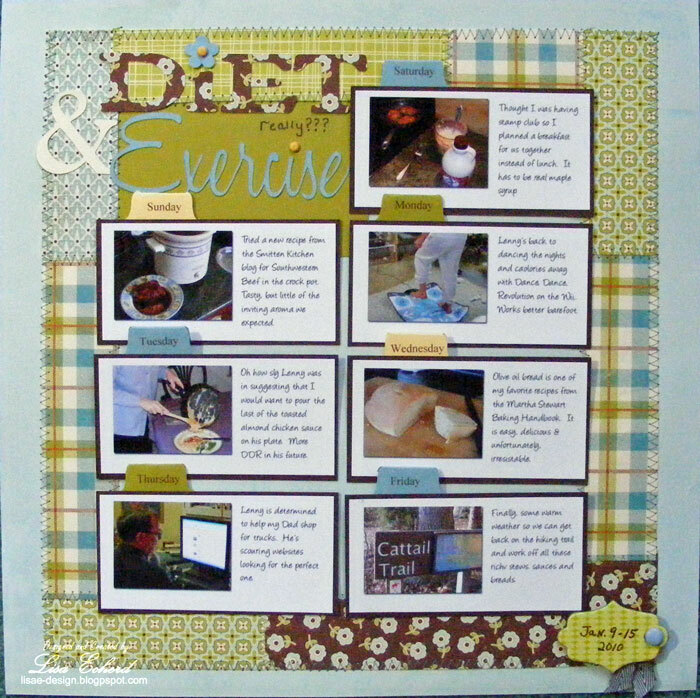 I did a recipe card theme to the page using a small photo from each day. This spread covers 2 weeks with unrelated photos about the everyday stuff in our lives. Personally, I prefer traditional scrapbooking over the photo and journaling card pocket pages. 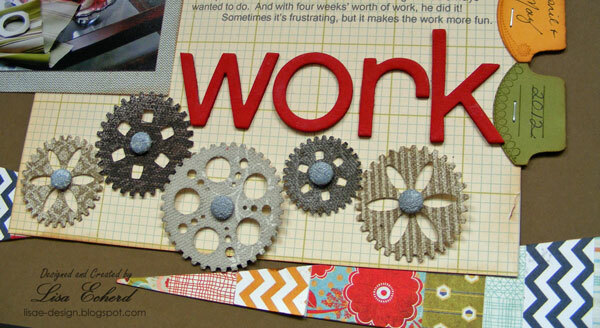 I think those have many benefits, I just like to use my photos in my regular scrapbooking. Over the next couple of weeks, I'll share some other thoughts I have on Project Life/365 and my plans for doing this again in 2013 including a video. If you are considering this project, I hope you'll visit often and find some inspiration here. I'd love to hear your ideas and plans, too! What would you like to capture in the new year? My card today is the one I’m giving to my husband for Christmas. 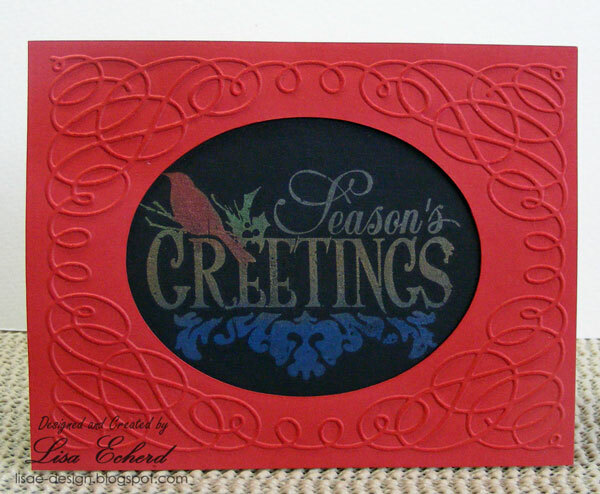 The wreath is stamped with white pigment ink on transparency film. In the Stretch Your Stamps card class from onlinecardclasses.com, the instructor used white Staz-on which I did not have. I can see why you would use this because I’m not sure this white pigment need has never really dried. I had to be super careful in handling this. Birds are a good theme for his holiday card. We get to watch them outside our living room window at the feeder. Lenny makes fun of me for feeding the birds and then complaining about how much they eat. I guess we humans just can’t be pleased. This Four Seasons stamp set is a hostess set from Stampin' Up! They put a ton of new stuff on their Clearance Rack recently. I was luckier this time and got almost everything I wanted before it disappeared. Two Peas is also having a year end sale in case you want to be your own Santa. Another on-line store for treating yourself is SimonSaysStamp.com. I'm entering this card in their weekly contest. The project must be something you are making for a Christmas gift, cards included. They have some really beautiful projects already posted for inspiration. 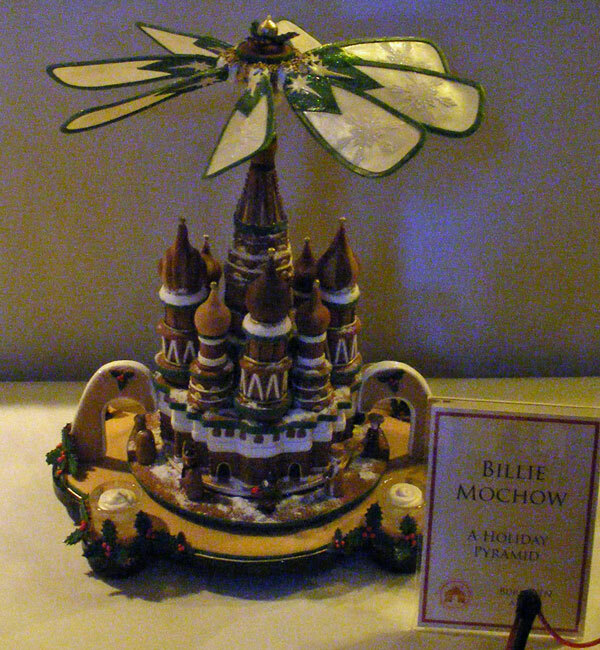 On Thursday my husband and I went to Asheville to the Grove Park Inn to see the gingerbread houses. One of the top 10 winners in the adult category. 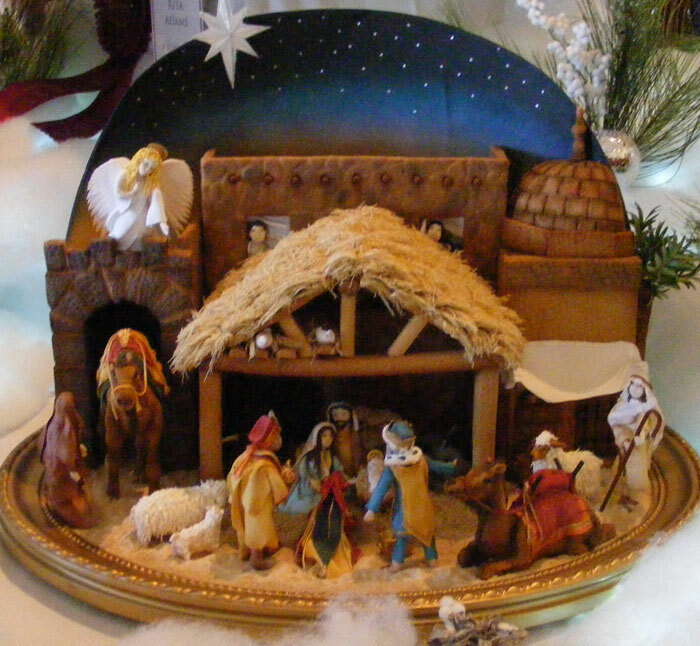 The Inn started doing this 20 years ago as a way to expand their Christmas decorating budget. My husband and I had stayed at the famous hotel in the early nineties and I was very disappointed that there were so few holiday decorations. So I’m very glad they came up with a creative way to decorate such a beautiful hotel. 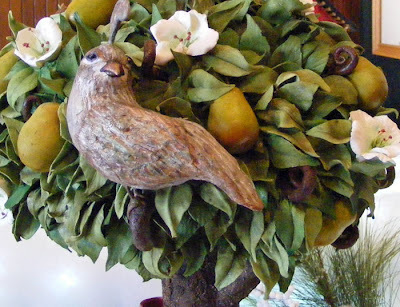 They have also added lots of elaborately decorated trees in the long corridors. Lenny was stunned and I was amazed at the creativity, engineering, and ingenuity that went in to each entry. 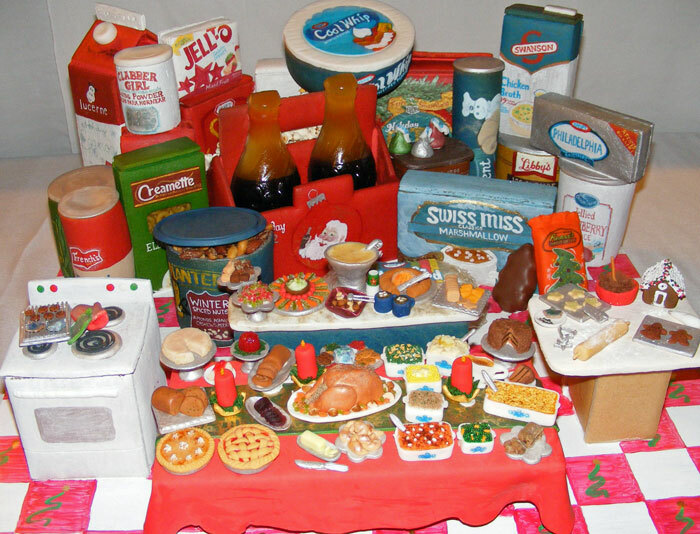 Each “house” was a diorama depicting some element of the holiday season. 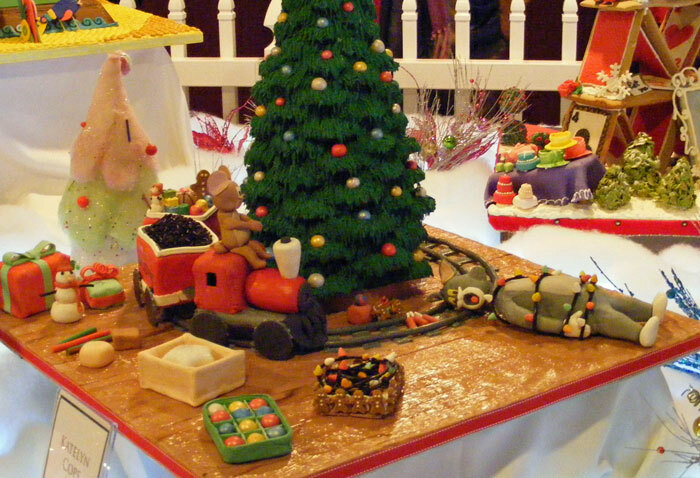 No one viewing the displays could believe that each entry was entirely edible. Each one has to be something like 75% gingerbread. Here are just a few photos which in no way do these creations justice. "Not a Mouse was Stirring." My personal favorite. That Mason jar is incredibly realistic. Can you see all the little mice tucked in their beds? The detail! Those tiny little Corningware dishes are about 1 inch wide! My husband's favorite was "The Partridge in a Pear Tree" How would you get those leaves to stay that way as you added more leaves??? One of the top 10 Teen entries. I love cats but I found this so cute with the mouse running the railroad. How do you hold up those delicate fans? If you’re ever in the Asheville, North Carolina area from Thanksgiving through the new year, be sure to visit the Grove Park Inn and see this display. When we left my husband commented that he would never again feel bad about spending so much time repairing and refurbishing a pinball machine. I’ll never think I spent too long on a scrapbook page again either because I can not imagine how many hours goes into making these gorgeous creations. To see the grand prize winner click here. I'll be back tomorrow with a Christmas card. Thanks for visiting! Hi! I did a couple of thank you notes this weekend to add to my stash. 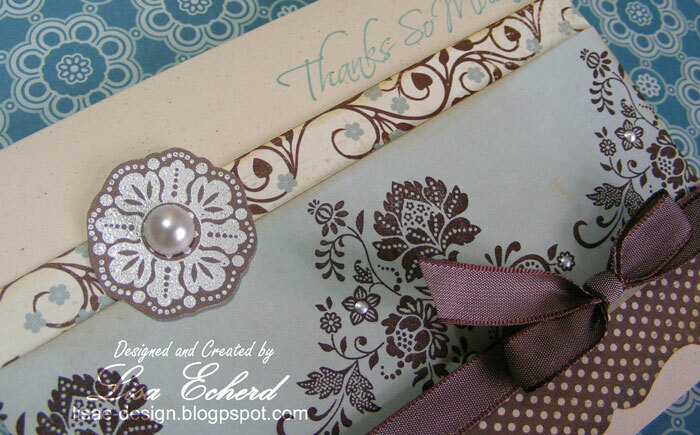 These use the Fresh Vintage stamp set that was part of Stampin' Up! 's 2012 Sale-a-bration. 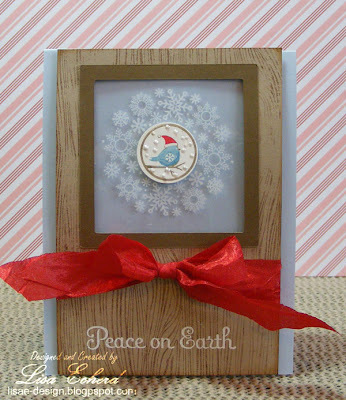 If you buy from Stampin' Up!, the 2013 Sale-a-bration dates are: January 22 through March 22. In past years, for every $50 you spend you get to choose something from the special Sale-a-bration catalog. I don't know the rules for sure this year. The freebies are always nice. 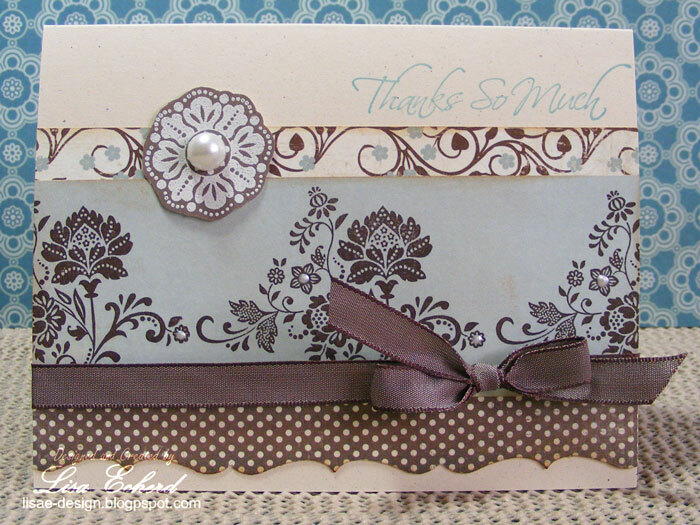 I used a My Mind's Eye 6x6 paper pad and some Perfect Pearls to complete this card. The ribbon is also Stampin' Up! 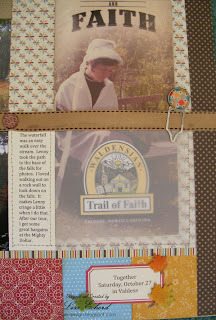 Today's page uses this month's ArtfulDelight sketch found here. Since I had this lovely photo from this summer, I wanted to do a page to talk about how my relationship with my stepdaughter has evolved. My step daughters came into my life when my husband and I had been dating about 6 months. They spent a month during each summer with him. We were all very polite at least in front of one another. Behind the scenes, I think Lenny got an ear full from all of us. I was only 27 and had no experience with teenagers. I was their Dad's first serious relationship since the divorce. The poor man! My relationship with Jaime, his oldest, became more friendly when she finished college and began her own adult life. Still, we never talked that much until her wedding. She asked for my help and I loved every minute of it. There were tons of phone conversations - we live about 1000 miles apart. It took a lot of coordination to plan inviations, decorations and work out the budget. Of course there were many things I had no part in because I wasn't there. Yet I felt very much included. With her marriage, she became a stepmother, too. So we have that in common. She is a full time mom and loves it! She is a very good mother. 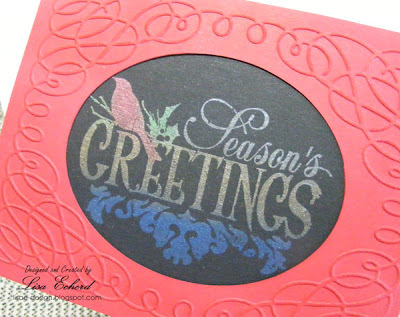 The embellishments are stamped using Stampin' Up! 's Petal Pizzazz, a retired set that has produced many, many cards over the years but I don't ever remember using it on a page before. I rotated the sketch, moved the title down onto some of the pattern paper, and centered everything up a bit. The video goes through the complete process. The Artfuldelight sketch is open until the 23rd. There is a card version, too. She offers a nice prize if you want to give it a go. Thanks for visiting today! To make this layout work, I had to switch gears a bit (OK, terrible pun! I just couldn't resist). Glitter Girl's challenge this week was to use 6x6 paper pads. 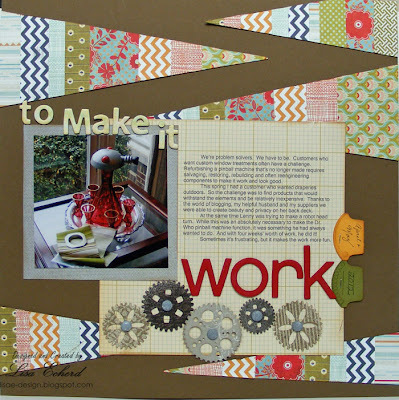 Usually I cut mine up into shapes and that is what I'd planned here with a row of rectangles coming down the page but something just didn't seem right to me so I took a break and did my exercises. While lying on the yoga mat staring up at the ceiling of my craft room, my eye focused on my watercolor wall quilt as it often does (who wants to look at a bare ceiling?). I started thinking about pattern and color and pretty soon I knew I wanted to piece together some of those 6x6 patterns and then cut them into a shape. So here we are, large pointed triangles. It sort of creates a chevron when put together though I really never planned that. Anyway, the idea was that we have to often piece together solutions to our customer's problems. That is what the photo is about. We’re problem solvers. We have to be. Customers who want custom window treatments often have a challenge. Refurbishing a pinball machine that’s no longer made requires salvaging, restoring, rebuilding and often reengineering components to make it work and look good. This spring I had a customer who wanted draperies outdoors. So the challenge was to find products that would withstand the elements and be relatively inexpensive. Thanks to the world of blogging, my helpful husband and my suppliers we were able to create beauty and privacy on her back deck. At the same time Lenny was trying to make a robot head turn. While this was an absolutely necessary to make the Dr. Who pinball machine function, it was something he had always wanted to do. And with four weeks’ worth of work, he did it! Sometimes it’s frustrating, but it makes the work more fun. 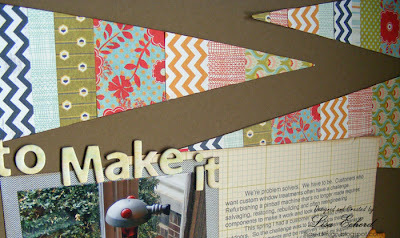 You can see my draperies on this post on my workroom blog. My customer took many of these great photos herself. The gears on my layout are canvas mistables from Prima. They were something fun I picked up in my Black Friday Two Peas order. I didn't have any brads the right color so I inked some purple ones in Versamark and then embossed them with Weathered Wood embossing powder from Ranger. After doing quite a bit of scrapbooking and Christmas cards, I think I'm going to switch gears (oh, there I go again :-) and do some Thank You cards this weekend. 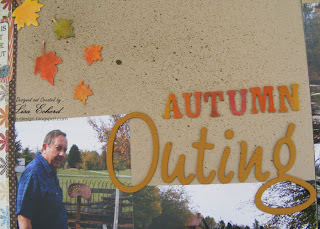 In October, we took advantage of a beautiful Saturday and visited a nearby town like tourists. We walked to a pretty waterfall and visited their outdoor museum. "The Trail of Faith" is a recreation of buildings from the lives of the Waldenses starting with a monastery in Italy through their exile to Switzerland, back to northern Italy and finally to the U.S. We were amazed at what they had to go through to preserve their religious beliefs. The trail even included a cave they had to hide in. The trail also included a variety of old farm equipment. Lenny told me the use of each item I was unfamiliar with and a few I already knew about but hadn't seen in use in many years. 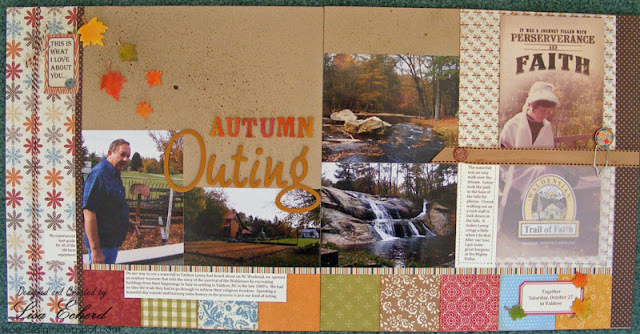 For the layout, I used fall collections from Simple Stories and Lily Bee. I really like the Simple Stories papers that are all over designs. For the title, I used some Mistable Thickers and chalked them in varying shades of yellow to red. "Outing" came from my favorite collection of Basic Grey raw chipboard - Wilna. I've only got a little of this left so I was really happy to get a word out of my remaining letters. The brochure from the museum is tucked into a velum pocket. Velum is making a comeback. One of my favorite uses is to create pockets for memorabilia. The little Basic Grey clip was part of my haul at the Mighty Dollar at the end of our sightseeing afternoon. For years, I've wanted to use this image from Inkadinkado so that the little bird and leaves could be individually colored. I get mixed results using markers on clear stamps. Plus these images overlaid one another so much it was hard to color the individual parts. For this card, I tried Perfect Pearls. The colors do run together some as expected yet you can see each individual component in its designated color. There is a nice sheen, too. These were the end result after a few disasters along the way. 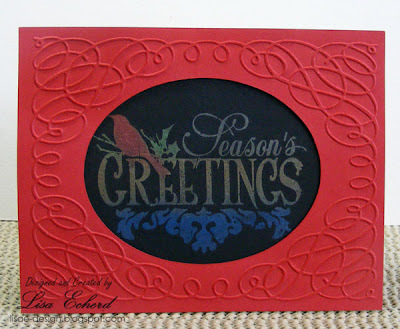 Originally I embossed these red frames at my friend Karen's house to use with a Santa stamp she had. Santa had to be colored with markers, crayons, pencils, whatever. I tried them all and poor old Santa ended up in the trash. (I hope this doesn't create bad Karma for Christmas.) I'm just not a great color-er and trying to color the red stocking cap that fell right between his white beard and a dark sky, also to be colored, was just beyond me. So, nothing personal, Santa, OK? Oh and one other disaster occurred in creating these cards. Right before filming, I accidentally tipped the green powder into all the other open containers!!! It was awful but fairly easy to fix by spooning out the green and the using dry brushes to lift off the rest. I lost some Perfect Pearls but a little jar goes so far, I'll never notice.